Four years ago, when I was pregnant with my first child, my husband and I discussed the pros and cons of the routine genetic screening offered to us. We settled against the tests, but three years later, when my son was diagnosed with autism, I thought back and wondered if, one day, genetic screening could detect this condition the way it recognizes Down’s Syndrome or Trisomy 18. How would knowing about my son’s autism have affected me during pregnancy, I wondered? Bonnie Rochman, a journalist who covered parenting and pediatrics for Time magazine, underwent a genetic screening dilemma during her third pregnancy, several years before she became aware of a study that gauged parents’ eagerness to map their children’s genomes, even when there was no worrisome family history. 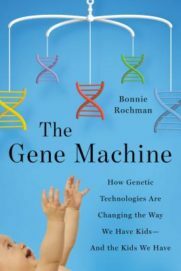 Rochman’s first book, The Gene Machine: How Genetic Technologies are Changing the Way We Have Kids—and the Kids We Have, explores the advancements of genetic testing and our emotional responses to a plethora of information not only about our own genomes, but our children’s. Examining multiple angles of her central question—“is genetic knowledge empowering or fear-inducing, or both?”—is one of Rochman’s greatest strengths as a writer. In the first chapter, “How the Jews Beat Tay Sachs: Carrier Screening,” Rochman takes readers through the story of eliminating Tay Sachs disease through carrier screening of Jews with hereditary ties to Eastern Europe. She introduces the reader to universal pre-pregnancy carrier screening, a sequencing that can identify thousands of genetic mutations in a person’s genome. Companies are offering these screenings when the medical community advises against them, for fear that patients will make ill-informed choices. “DNA is not necessarily destiny,” Rochman articulates. But try telling this to a couple who has learned of dozens of genetic variants, all of which could lead to them, or their child, developing a disease. In an insightful chapter titled “The Other Scarlet A: Abortion,” Rochman explores a complex aspect of advances in genetic testing and reproductive choice—what to do when you learn your baby has a fetal abnormality. “While there are women who’d never opt for an abortion,” she wrote, “it’s disingenuous to ignore the fact that terminating a pregnancy is one possible outcome of earlier, more sophisticated genetic tests. The issue of how people feel about disability and, in turn, how that impacts their decisions regarding abortion is an essential aspect of any discussion about advances in prenatal testing.” This chapter is remarkable for its balanced and nuanced approach to one of the most charged debates in our country. Rochman presents personal stories from women who have chosen to terminate pregnancies once they learned of a fetal abnormality. Then, she presents the views of disability rights advocates who argue that earlier and more detailed screening is a step backward in the fight to increase awareness and inclusivity for people with disabilities. She challenges the popular conception that prenatal information ensures a healthy baby; rather, she argues, prenatal testing is a means of asserting control over what kind of baby we have. “Perhaps we take refuge in circumlocution because it feels strange to acknowledge that prenatal testing allows us to play a role in deciding what sort of child we will have,” Rochman reflects. The Gene Machine is a timely book for expectant parents as they navigate the new prenatal testing choices offered to them during pregnancy. Rochman covers fast-changing, emotionally charged territory with intelligence and compassion. This entry was posted in Uncategorized and tagged Fall 2017 on October 24, 2017 by Kelly.